From his earliest days in the laboratory, Joel Pomerantz got caught up in “the thrill that you can actually discover new things with your own hands, with your own mind.” As an undergraduate at Brandeis University, he spent a summer learning how to detect biochemical changes that enable white blood cells to fight infections in Frank Austen’s lab at Harvard Medical School. At Brandeis, Pomerantz continued to focus on immunology, working with Ranjan Sen (now at the National Institute on Aging) to study DNA “promoter” sequences that ensure precise regulation of gene expression in white blood cells. This research, he says, “altered the trajectory of my career” by prompting his interest in the molecular biology of how genes are controlled. In doctoral research in Phillip Sharp’s laboratory at MIT, Pomerantz worked to unravel the intricacies of transcription factors—proteins that can trigger the expression of specific genes in response to changes in the environment inside or outside a cell. He concentrated on the transcription factor NF-κB, a potent regulator of immunity, as a postdoc with David Baltimore at the California Institute of Technology. NF-κB has been dubbed a “first responder” because it is poised for activation by a variety of cellular stressors, including bacterial and viral pathogens, heavy metals and ultraviolet irradiation. More than three decades since the initial discovery of NF-κB, Pomerantz and others are continuing to decipher its cellular activities and its relationships to disease. Since starting his own laboratory at Johns Hopkins, Pomerantz has focused much of his research on CARD11, a protein he discovered during his postdoctoral work. His studies have shown that in B and T cells of the immune system, CARD11 is a critical component of the machinery that relays signals from the outside of the cell to the inside—when a receptor on the cell’s surface senses an invading pathogen, CARD11 helps to activate NF-κB to mount a response. 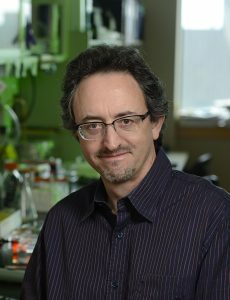 Pomerantz became a Rita Allen Foundation Scholar in 2005; the award allowed him to pursue what he describes as a “risky, untested approach to finding new components of the immune system.” His team developed a technique to screen for proteins that affect CARD11 signaling activity in mammalian cells, which led to the discovery of GAKIN, a novel inhibitor of CARD11. GAKIN is a kinesin, a motor protein that helps CARD11 and other associated proteins move to appropriate sites within the cell to achieve immune signaling function. Pomerantz’s work has since revealed further details of how CARD11 fine-tunes the regulation of the NF-κB pathway to respond to infection, while at the same time keeping the activation, growth and proliferation of immune cells in check. Mutations in CARD11 can interfere with this delicate balance, as in some patients with lymphomas—cancers that involve the rampant growth of white blood cells. Pomerantz’s research has focused on understanding how these mutations affect NF-κB signaling. “We’ve been able to fill in some of the gaps in knowledge as to how these pathways work and how the lymphoma cells engineer their own dysregulated growth and survival as they develop into the disease that cancer patients suffer from,” he says. Here, Pomerantz reflects on his early interests, the importance of supporting young scientists, and new directions in his research. What attracted you to a career in science, and to studying the regulation of gene expression? I went to college not knowing for sure that I would be a scientist. What really cemented it for me was that Brandeis was a small liberal arts college that also had world-class graduate-level research labs. I was able to interact with world-famous scientists who were doing cutting-edge research in biochemistry. It was just a random chance that I ended up in Ranjan Sen’s lab. I was taking a biology course, and the teaching assistant happened to be a graduate student in his lab. The TA told me Ranjan was interested in hiring an undergraduate to do research, and I said I would try it. That decision opened up an interest in the molecular biology of how genes are controlled, how you get appropriate regulation, the right gene going on in the right cells at the right time, and how this can go wrong with disease. I was an M.D.-Ph.D. student at Harvard Medical School, so I did my first two years at the medical school at Harvard, and then I did my Ph.D. at MIT with Phillip Sharp, who is one of the world’s experts on gene expression. After that I realized I did not want to practice medicine, so I dropped out of medical school and, after a year working with Carl Pabo at MIT, ended up seeking a postdoc in David Baltimore’s lab. I entered into this network of people doing fundamental research on gene expression and chose these labs out of a certain amount of naiveté and trusting the recommendations of my mentors, and I was lucky that they worked out as well as they did. What’s your perspective on the importance of mentoring and support for young scientists? When I first started my lab and received the Rita Allen award, we were able to apply a new technique to make a very insightful discovery into how the immune machinery works, and how a cell can regulate where the machinery is located as it responds to an infection. One of my first graduate students, Becky Lamason, was able to use this technique, find this molecule and publish a relatively high-profile paper with herself as first author. That led directly not only to our laboratory’s success, but to her success, and that started her off on a great trajectory. She ended up doing very well and won several awards. She did a postdoc at UC Berkeley, and she’s about to accept a faculty position and establish her own laboratory. I would say that this kind of support for early-career researchers is not just important to the individual investigators. It influences all the people they end up mentoring, all the people they interact with, and all the people who read their research, who build on their research. It really spreads out to the larger scientific community. What questions are you focusing on now, and how are you using new technologies to address them? We are still very focused on understanding CARD11 and how it signals to regulate immune cells in health and disease. CARD11 is mutated in non-Hodgkin lymphoma and plays a critical role in promoting the aberrant immune cell growth in that type of cancer. CARD11 is also mutated in at least three types of immunodeficiency, a syndrome in which the patients suffer from a weakened immune system. We are using the new CRISPR/Cas9 genome editing technology to engineer mouse models of the diseases that CARD11 is involved in, and to study other proteins that work with CARD11 in those diseases and in the normal immune response. We are also developing new screens to find undiscovered partners of CARD11 to help understand how exactly the protein regulates immune cell behavior.